None of the things we have achieved would have been possible without the team that makes the club work, which includes the committee, all the run leads, all the people who help out in so many different aspects of the club. The club keeps to the core principles of fun, social, benefit of runners and value for money and it is great that most people understand that. 12Ks of Christmas, our new virtual run, exclusive run and medals for club members and was fully sold out. We have had some fantastic social events during the year; we kicked of the year with the annual visit to the Ice Hockey in January. We have been to the Brassiere at MK college, a great club Christmas party and just recently the MK Biergarten opened its doors just for us. We have held in 2016, eleven of our free beginners groups, which has seen 385 people start running with the club, we have during the year continued to review these courses and make improvement, we now have a core group of Beginners groups run leads, started doing surveys with the beginners to see what we are doing well and how we can improve. We think we have done pretty well over the years with the beginners groups and over 30% of club members started in one of our beginners groups. But we are not stopping there recently with Bucks Sport we ran a course looking at how we can improve with retaining the runners from week one to becoming a full and active club member, so will be putting into use some of that learning. Last year we as a group have run from Milton Keynes to Miami in Florida on all the club runs, but if we all turned up for one run then we would fill Vicarage Road Stadium (Watford ground). Always great that we can support a members elected charity of the year with Bravery Boxes receiving a £4,417 from money raised by the club in the summer, this year our charity of the year is Haemophilia Society. In addition to this the club has supported many local events and races in Milton Keynes to help other runners, with a big turnout in May for the Milton Keynes Marathon weekend, we had 28 helpers at the Silverstone half marathon, we ran a water station at the NSPCC MK Half Marathon and helped at two water stations at the MK Winter half at short notice. During the year a number of our runners have attended training to be able to support runners who may need a little extra help to enable running, this has really worked well and benefits of this programme have already been seen. I have run off and on for a couple of years, but started running “properly” in January 2016, and joined Redway Runners in early September 2016. I am a member of my work running club (Ordnance Survey) but don’t get to run with them that often, due to where my work takes me. Redway Runners is my only experience of a running club really. The support and friendship. I have made so many new friends already, and always feel I can ask for advice about my running or events, or just have a good laugh with like-minded people. Running in a group is so much more rewarding than running solo. It means a lot. I love having something to aim for and knowing that while I am doing that, I can socialise and have fun – this makes what might seem difficulty, that much more achievable. I remember rolling up at David Lloyd on a warm August 2016 evening on a Thursday not knowing what to expect, but was warmly welcomed by many – Ian Stevens was particularly helpful and reassuring! I tagged along with Paul CJ’s social run (the self styled “best run of the week”…) and it was great fun. Chatted all the way round with many people, the five or so miles flew by and although I was gasping at the end, it was great fun. I was hooked. Work and family means my days are normally Tuesdays, Thursdays and Sundays. This year has been very much about finding out whether I can actually run and if I enjoy it – I think I can and know I do! Explorer on a Tuesday with Tim is a really good run, Social on Thursdays and the Sunday Club run. Next year I need to get more technical and start to understand how things like intervals etc can help me. I have really enjoyed running with Tim, Martin P, Tif, Ian S., Paul CJ, Paul W, Gillian, the list goes on and on, the great thing is getting to know new people each week. I played a lot of team and individual sport when I was younger, but was never a runner. I started to dabble a few years ago, but in January 2016 I said I’d try a bit harder and run more regularly, so entered the MKM Half marathon, and trained (badly) for that, running solo. I stuck at it though and realised if I wanted to get better and enjoy it more, I needed help, so here I am! 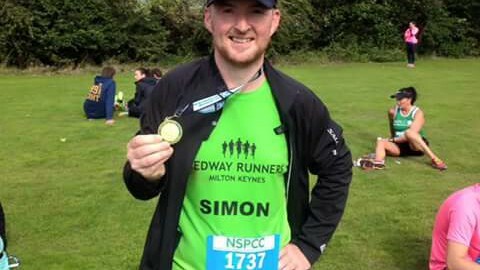 Even though I have since started to speed up a bit, my NSPCC half marathon was a watershed moment – it confirmed to me that I could actually do this, that I was getting better, that I could plan a run and most of all enjoy it. To relax my body and mind, test myself, achieve new things and to meet new people and have fun. How come you have been on the TV a lot this year? I am lucky enough to work for Ordnance Survey, and in my role of leading our work on Future Technology for Smart Cities, I get to do a bit of technical talk in the media. This year I have done BBC 5 Live, BBC Radio Wales, BBC Manchester, a host of syndicated radio interviews, met Rory Cellan-Jones of the BBC, Spanish TV and a live slot on BBC Breakfast News 24 – all great fun. Next time I will plug Redway Runners! The backs of peoples heads far too often, although some of those heads are getting a bit nearer…. I recently ran in Barcelona and Amsterdam, and love running in the Pembrokeshire Coast National Park, but I would have to say MK – I’m a local boy and it’s where I have started to enjoy running. I hope to run many other races in many other places, but for now MK will do for me. It’s taken me a little while to concentrate less on what is directly in front of me and more on my surroundings. I enjoy running by water, it’s so calming and you see a lot of wildlife and activity. Best thing is to see lots of other runners, either with me or just enjoying their run. The ninja squirrel that decided to drop from a tree right into our path on a recent early Sunday run, causing a few of us to leap up and over it while it scampered across the path, realising what it had done. Films – it would be too easy to say Forrest Gump or Chariots of Fire, so it’s Marathon Man or The Jericho Mile. I rarely listen to music when running but if I did, then Keep The Car Running by Arcade Fire is a good one to get you going. 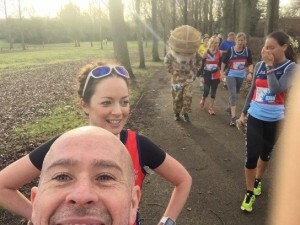 The recent MK Winter Half. Man-flu, the deadliest of all illnesses as any man will tell you, scuppered months of good training and although I got around, I fell well short of what I planned for. It was a lesson though and one I will put to good use. My favourite athlete is Michael Johnson and I love his phrase “The only one who can beat me, is me”. It shows how strong he needed to be both mentally and physically. 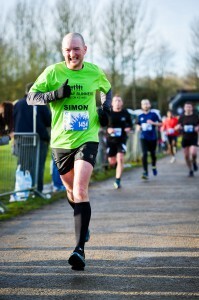 Attached photo of me from MK Winter Half. Flying feet, gritted teeth, sprint finish after a horrible race. How you start is important, but it’s how you finish that counts. Thankfully not yet. I don’t intend to either! The Explorer run always has great routes and the Wolverton route out along the river is a particular favourite. Michael Johnson, Alistair and Jonny Brownlee, Victoria Wood (RIP), Joe Strummer (RIP) and Ben Smith (401 marathon man). An eclectic mix that would test me, make me laugh and inspire me! I don’t listen to bad advice! I will find out in May 2017…. Everything and anything, it’s an opportunity to sort things out, dream a little, forget everything or just have a chat. I have managed to allay fears, organise work, plan days out and solve problems all whilst running. I don’t do any cross training! I enjoy a mixture of road and trail runs. Road/redways are so accessible, and we are lucky in MK – you can hop out of the door and get going. Trails are just fun, you know you will never get bored. Love, especially on hills of course…. The beauty of running is that you can do it at any time. I do share via Strava and Facebook. I’m a bit of a tech geek so do like tinkering in Strava and Garmin Connect, and have recently started following and sharing runs with other club members. I like to see how people have run – my work means I analyse a fair bit of data and get involved with behavioural aspects of how people live in the built environment so I do absorb a lot of info. 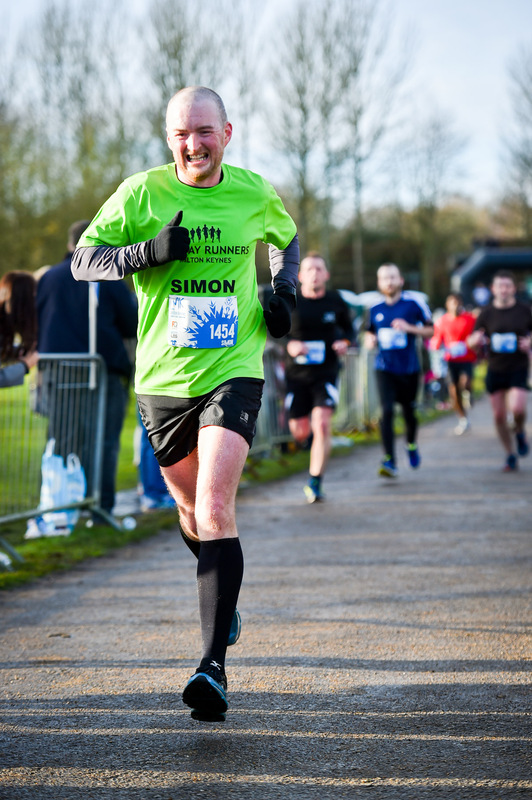 NSPCC Half – it was a watershed moment for me with regards to being “able” to run. I also really enjoyed buddying at a parkrun recently – so good to give something back and see other people achieve their goals. Half marathon. No idea why. Not really ran anything else! Granola for breakfast, water to drink. I struggle to take on food when running, so try and get some in an hour or two before. I know I need to work on this for a marathon! I think a run along the Cliffs of Moher in Ireland would be awesome as would the Olfusa River in Iceland – both look amazing, and are often quoted as favourite runs, and don’t seem that unachievable. Great Linford MK. Nice course, quite intimate, easy for me to run with my eldest son. My inhaler. It’s a non starter without it. 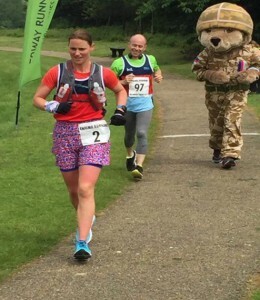 Redway Runner member, good friend and helper Sgt. Mack has had quite a year! Below is his story. It was good to follow his progress as he was well supported by Redway Runners members on his quest. Well done Alan!! 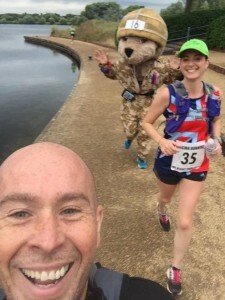 145.1 Miles dressed as a bear. could run the MK Half as Hero Bear?” Yes ok I can do that, what is Hero Bear? 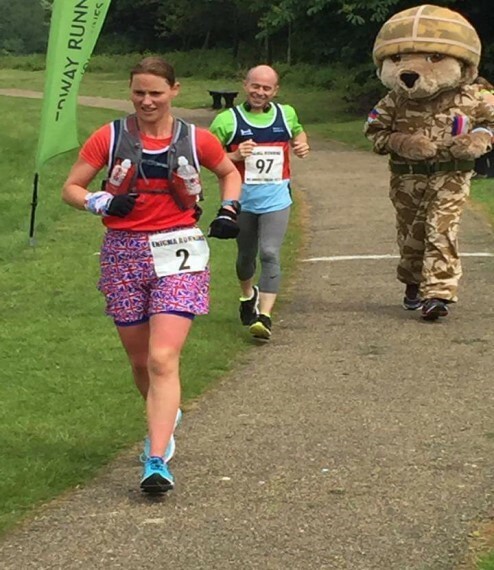 Little did I know at that time what it would take to run a half marathon (MK Half 2015) in the Bear costume? Mark went on to explain that it’s normally used for 5k and 10k runs and promotional things when the normal mascot is just too heavy! Marathon bear is lighter by about 1k! 12kg compared to 13kg. He also said you’re practically blind in it so advised finding someone to guide me. 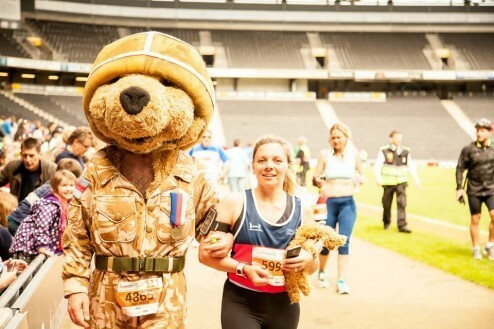 So anyway that was how I was to run the 2015 MK half in May. I then had a chat a couple of days later with my great friend Lisa explaining what I knew and asked her if she would guide me? Her reply was instant “Yes of course” We also roped in Kerry and Sarah to also help. Well the big day arrived and we got our self’s to the start line and of we went, omg I was so not ready for the next 13.1 miles, first is just how bulky the costume and the head are, second is how hot I was getting! All my sweating was doing, was making the costume heavier. Thirdly running almost blind was scary to say the least if not for Lisa I doubt I will have made it to the end unscathed. Mount Farm Park Lake, however we crossed the line at a painful time of 2:00:01 yes one second over two hours!!!! commitments I didn’t manage the 262, was in fact 145.1 miles. Run with Lisa and Kieron as my guides, but the run didn’t go to plan because H4H had had a new costume made with better vision out of the Bears head but unfortunately the inner helmet that it’s all supported on was way too small for my head, so it just sat high on the top of my head which just gave me a splitting headache and by the end had started to take the skin of the top of my head. 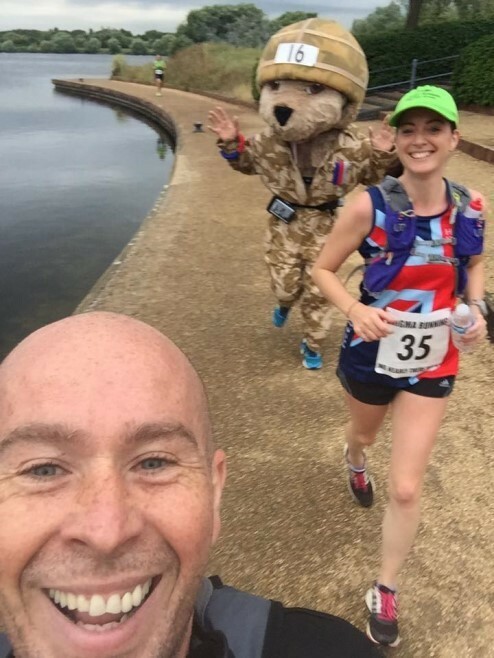 The following week was upper Heyford Air base Half Marathon guided by Emma D with no time to send the costume back to the makers I had to improvise a homemade pad to fit inside the inner helmet which did the trick for the day. melt down thinking I was about kick the bucket. Next was the Redway Runner Festival with Abi and Kieron as guides, uneventful run if running with a torn hamstring. Then one of the big ones for H4H Swansea Half they are one of the official charity’s for this marathon it was great because I finally got to meet Mim, my contact at H4H and the lady who sorts the costume for me each time. Once again my guides were Lisa and Kieron, it was a good run not fast but a nice route but it was a very warm day so dehydration was a serious problem! Seemed no matter how much I drank it wasn’t enough. needed and she was a doctor anyway and was more than capable of taking care of her friend. Then Planes Trains and Automobiles half marathon at Caldecott Lake, guides Kerry C and Kieron. Not really much other than it went very well Kerry and Kieron were amazing and got a great medal. Windsor half was another official H4H charity one, for this one we had a plan to try and beet that elusive sub 2 hour time, we didn’t know how hilly it was but I felt good at the start and it was not to warm, my guides were Lisa and Kieron once again. Even though the start for the first mile is up hill we got off to a flyer all was good until about mile 3 when the sweat had started to become a real problem by getting into my eyes, I had forgotten to take my sweat band so my eyes were burning and its imposable to wipe them while wearing the head. time over two hours 2:02:41 to be exact, still Chris Evens mentioned Hero Bear on R2 the next day! 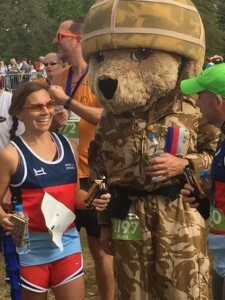 (Hero Bear smashed Chris’s time ) Once again Mim and the H4H team were there which is great for their support and help. And last but not least the MK Winter half with 5 guides! Amanda, Dr Emma, Kerry, Alex and Kieron. The toughest one yet simply because I had not run for over a month due to injury. We got to mile 11 and for the first time in my life I did not think I could push myself any further, was only when Abi turned up and started to take the micky that I managed to get moving again. They all managed to get me over the line in about 2:23.
where my limit is, every time I have got to a point where I thought I could go no further I then went further! Same with pain I still hurt if I stub my toe or cut myself with paper but I can also lock pain away inside my head and not let it get in my way. I guess that’s stamina. 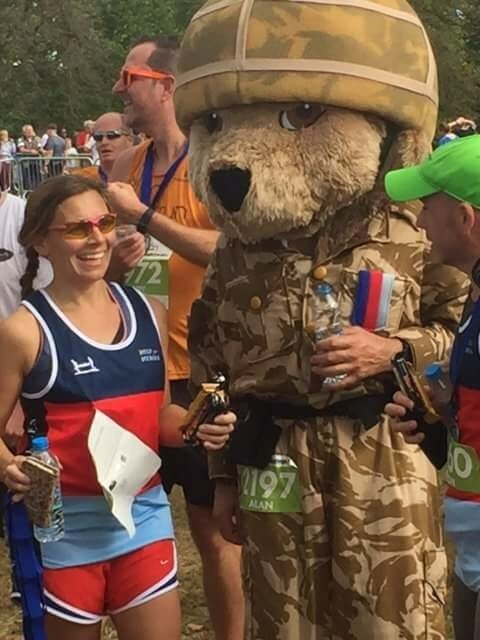 One thing during all of the miles this year has been knowing that for me it will soon come to an end and I can get out of the costume and relax, not so for the guys H4H help every day of the week. Please remember they are in that position because they were protecting you. Thank you for taking the time to look through this. Also a massive thanks to my guides this year for making it possible. Have you always wanted to run, how about finishing a 5K in March this year, then who knows what next, 10k maybe a marathon, or maybe just running with new friends and having a chat to put the world to right, while getting fitter, it is all achievable. Then the first step is to sign up to one of the free 10 week Redway Runners beginners courses starting in January, yes you can do it, the first step may be the hardest but then it is a journey you will not look back from. http://www.redwayrunners.com/wp-content/uploads/2015/10/DSC01701-e1446138045888.jpg 2177 3962 Martin Lawrence http://www.redwayrunners.com/wp-content/uploads/2013/04/logo.jpg Martin Lawrence2016-12-17 19:48:102016-12-17 19:48:10Would you like to run?